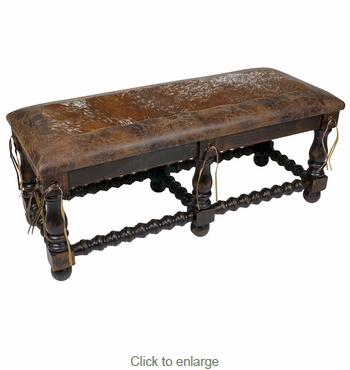 Cowhide & Leather Western Bench 46"
This rustic western bench with padded leather and cowhide seat will enrich any southwest or Mexican Colonial ranch decor with its antique look and rustic charm. Featuring turned legs and leather accent strips, this bench can be used in an entry way, family room or bedroom. The one-of-a-kind character of our western furniture is enhanced by the dark patina stain and premium selected cowhides. These unique pieces are all handcrafted in Mexico by talented artisans. Each piece is a unique creation, so expect some variations in hides and leather appearance.